Bear Creek Church was the first church in Adair County. It was organized in 1838-39 by the Rev. Talbot Hight. Charter members included the: Asher, Barnes, Collett, Conner, Hibbard, Hudtson, Lloyd, Myers, and Willis families. It was erected by the business women's circle of the Woman's Missionary Society, First Baptist Church of Kirksville, Missouri. Marlene sent this to me, Thanks Marlene! Kirksville, Mo., Express & News, Wednesday, Sept. 12, 1979. Raymond Walters of Novinger bought at an auction an old history of Missouri published in 1888. From it I have gleaned the following stories about the settling of our county. In 1828 the red man and wild animals were the principal occupants of the country west of the ridge where Kirksville is now located. Buffalo and deer roamed these hills, and the nearest settlement was that of James Loe, down in what is now Macon County. The first settlement of Adair County was made in 1828 by James Myers, Isaac and Stephen Gross, Nathan Richardson, Reuben Myrtle, and a single man named Gupp. They built a block house in 1832 on the land which later became the farms of George and Philip Cain and King Collet, six miles west of Kirksville. In 1830 Andrew Bozarth and his sons, with Isaac Parton, came to this area, leaving their families in Howard County. Bozarth was killed later at the raiding of Tribute Mill in Clark County. Shortly after the above named men came they were joined by Canady Owensby, William Taylor, David E. Sloan, William Parcels and son, J. H. Parcels, Josiah Roberts and Abe Erhart. The only veteran of the revolution who had been known to live in Adair County was John Lay. In 1832 he and his wife and son, a gray-haired, tottering old man, halted at the William Horton cabin to ask directions, and Horton asked why such an old, old man was on the road west. "I'm pretty old," said Lay, Jr., but I had to come to keep Father and Mother company. They are in the wagon." "Well now, by thunder," said Horton, as he jumped off the fence, "Stop your team! I want to see them!" This was done, and there were the old soldier and his wife-each full of life and delighted with the frontier. This aged woman it is said, could spin a flax a day even after she was a hundred years old. In the early pioneer days brush fires were common, for the Indians were accustomed to encircle a large tract of country with fire to corral game. Once when a man named Nathaniel Floyd and his wife were returning from a visit to neighbors they were cut off from home by a line of fire. Their horses refused to cross the fire, so Mr. Floyd, took them a circuitous route around the fire. Mrs. Floyd, however, undertook to cross the fire on foot. Her long skirt caught fire and her dress was burned completely off her. Her husband did not find her until the next day, and her body was so severely burned she bore the deep disfiguring scars all her life. Another story related by the pioneers is that William Floyd, who was riding through heavy prairie grass as high as a horse's back, saw an object which seemed to leap or be tossed high above the grass about two hundred yards ahead of him. As he approached he could see it was a man. He rushed up to discover that his neighbor, Coleman Stewart, was lying on the ground beside a large buck which ad one antler torn off and its forelegs tied with Stewart's suspenders. "For God's sake, help me, Will! Stewart yelled. "I'm plum wore out!" So Floyd cut the deer's throat and helped his dirt-caked, black-and-blue friend to his feet. Stewart explained that he had shot off the deer's horn, stunning the animal. And then the deer charged him, but Stewart managed to hang onto the remaining antler and pin the animal down, tying his forelegs. Then, his strength exhausted, he lay down beside his prey. Jesse Walker and the Adkins family were here prior to 1835, but Jones and others left the wilderness with the intention of returning. From 1835 to 1845 the Indians were regular visitors. The Keokuck Indians were friendly, but not so their dogs. They often attacked hog pens killing all the pigs. The settlers complained angrily and sometimes violently so that the red men never visited their locality again. In 1835 Bennett Brown and Samuel Hoy came to Adair County with their cattle. They reported black bear plentiful on Billy's Creek, panther everywhere, black wolves in small packs, and forest wolves two packs to every four square miles, otter and muskrats always ready for the hunting, and honey to supply ten-thousand tables. Macon (known as Moccasinville in pioneer days, tax collectors were paid in beeswax, wolf scalps or small furs. The James family were early settlers of Adair County, coming in 1828. John Myers was killed in a battle with the Indians on the Chariton, that battle precipitated by his son, James. Robert Myers, another son, settled on Bear Creek in 1835, and Jesse Walker and his brother James were his neighbors. In 1835 Edward Steward bought 160 acres in Floyd County from Nancy Floyd, paying her two-and-a-half pounds of coffee! He brought with him two hundred hogs and realized large profits. Stewart and Frank Adkins were hunters; at one time they had eight or ten barrels of honey and over 8 hundred bee trees standing in the woods. One day Steward and his brother, George, tracked a bear into a thicket on Steer Creek, and surrounding the thicket. In a short time the dogs were heard, and then a huge panther dashed past, and in another George came rushing up, saying, "There's a dean of devils in here, and they're killing every dog we've got!" Rushing his horse through the bush Stewart saw one of his dogs with a leg broken. Dismounting he bound the wound with his shirt sleeve and then proceeded to the scene of battle where he saw a huge female panther bound into the thicket, leaving two cub panthers in the arena. The two cubs fled when they saw him. George soon arrived, and pulling one of the junior panthers from beneath a log, the combat was transferred from panthers and dogs to panthers and men. George swung the panther round and round until Ned came to his relief; the latter tried to enwrap the swinging brute in a guilt, but it was torn to shreds; a large tanned deer skin was next tried, and the instant this enwrapped the animal George let go his hod, and on the ground the panther struggled for his liberty. Both men leaped on the animal, and when he worked his paws through the hide, seized and tied them. Then they placed a pole on his neck, tied his hind feet, and turned their attention to the other cub which had run up a tree. Ned climbed up and cut down the limb on which panther number four rested. No sooner than he sprang up the tree in pursuit of his tormentor. But George caught his tail and held him until Ned came down. when both captured the brute. During all this time the dogs kept the old female panther off, and she was driven up a tree. She was so furious they did not dare approach her. Ned fired twice and broke her shoulders. Still she fought, and the men dared not shoot for fear of killing a dog. George threw a hatchet at her which struck her above the eyes, but she caught the hickory handle and tore it to splinters, even leaving her teeth marks on the blade. Ultimately Ned Steward shot her through the head, and then left the field for combat, followed by the male panther to within a few rods of their home. The next day the men followed and killed him. They sold the buss in Randolph County to a showman for $50. When it is considered that it required five or six yoke of oxen wonder that men selected the friable soil of the valleys, however unwise such a selection might prove. Owenby could work only in early morning or late in the afternoon, for during sunshine, myriads of green-headed flies would drive his cattle or horses wild; even the deer were driven into the woods by this horde of flies. Robert Miller's four daughters stand as monuments of early days. These strong-limbed, shapely damsels could hew logs and raise a house or barn with their father's help. Colonel Jesse Jones, from Mercer County, Kentucky, came to Randolph County about 1832. About 1835 he sent "Rob" and "Paulina" (daughters) up to Adair, on the Chariton, west of Kirksville to run a stock ranch horses, cattle and hogs. In the spring of 1837 the Jones and Collet families came, and Jones opened a farm on Section 10, township 62, range 16, clearing heavy timber, etc. Col. Jones had about twenty slaves, one of which "Uncle Issac," lived about into the next century. He had a water mill on the Chariton at the Macon County line, but up a horse-mill at his farm, and a ferry which ferried scores of emigrant teams to the Grand River country, and also had a small store, bringing goods from Hannible via Shelbyville, following the "bee trail" part of the way. The flies were so bad he had to travel at night in summer. He whip-sawed some lumber for his buildings. He stated that there were only about six families here when he came  Bozarths, Owensbys, J. Fulcher, and Easton lived on the upper Chariton. Early settlers who came to the county in 1842 include David B. Rice, Nathaniel Scoville, Simeon Carson, A. T. Hite, William Roberts, Thomas Pollards, Thomas Williams, The Lesleys, George Buckalew, A. S. Bryant, John R. Adkins, Auson N. Ely, John Boyle, Joseph and Horatio Deibridge, William Waggoner, Mancel Garret, John B. Earheart, Joseph Stewart, Dr. Abram Still, Leve Lanesberry, George Clevenger. Early hunters came from all parts of the country to north Missouri prior to its organization into counties. They were selfish men and unprincipled in their dealings with the Indians. They often ordered Indians living in the hunting grounds they had chosen "to pack up their belongings and leave. Once a band of hunters, mostly settlers, chose a range, but on going there found that some Indians under Black Hawk were in possession, although the Indians were absent on a hunt at the time. The white men ordered the squaws to pack their belongings and leave, and the frightened women were gathering up their few possessions and taking down their teepees when a shot was heard in the distance. One young squaw flung down her burden and dashed into the forest shrieking. Her cries were answered by a war-whoop, and immediately Black Hawk stood before the cowering white men. One of the intruders ventured to explain, but the chief dashed his open hand against the speaker's breast, ordered him to leave, scathed the trembling whites with a flinty glare pointed imperiously toward the east. The white men sneaked quietly away. The last great Indian hunt in this part of Missouri was in the fall of 1837. About two hundred Sacs, Foxes, and Iowas, came down the Chariton and camped at Collet's spring for some weeks, hunting through the county; they had dances at the springs, and settlers went to see their games. The first Indian troubles in the country took place in July, 1829, caused by James Meyers, and resulting in the death of several man who came to aid him and his fellow pioneers. The first death was that of Lovern Eveans. His coffin was made of puncheons, hewed from a tree with an ax. The first marriage was that of Missouri Evans to Levan Dean, celebrated at John Cain's house. The first birth in the county was that of James M. Bozarth, born December 14, 1831. George Cain and Julia Floyd were early children. 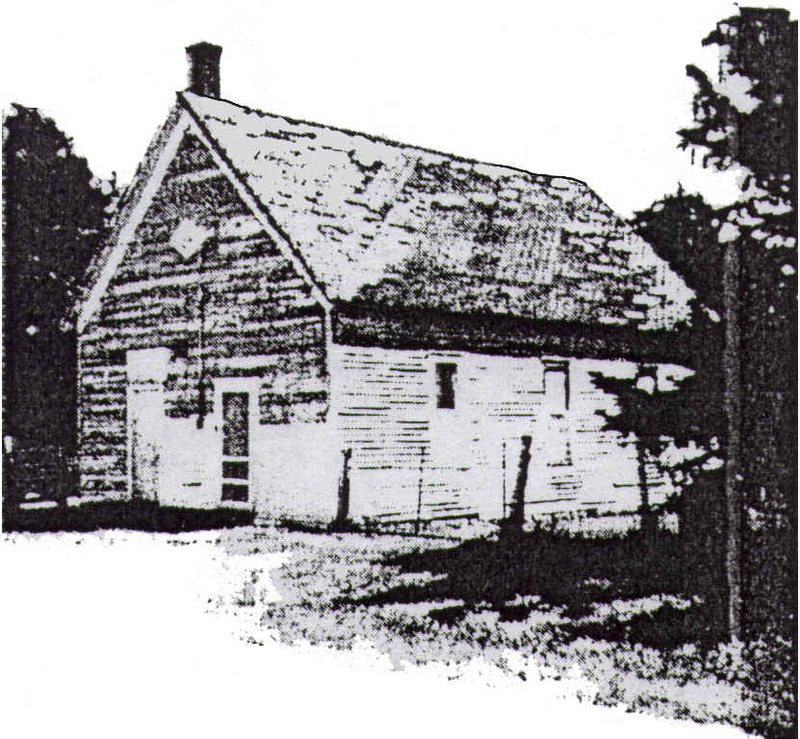 Bear Creek church, built by Missionary Baptists, was the first house of worship. The lin Grove Meeting House followed in November, 1842, to Jesse S. Jones for ferry on the Kirksville and Trenton trail over the Chariton. Th rates were fifty cents for a four-horse wagon, thirty-seven and a half cents for a two horse wagon, twenty-five cents for a one-horse wagon, twelve-and-a-half cents for a horse and man, six and-a-fourth cents for a person on foot. Jesse Kirk kept the first tavern at Kirksville. He also was the first postmaster there and served as first treasurer of Adair County. In 1838 the first crop of timothy grass was sown by William Collett; Mr Hulsey was the first visiting preacher. He came here after the Reverend Doctor Abram Sill and Rev. James A Radcliff settled with in the county. Then Ned and George Stewart presented the hides of two panthers of which Dr. Still made a coat. Bright G. Barrow was the first resident lawyer of Adair County. Otho H. Beeman erected the first brick house at Kirksville. Judge Beeman made the first iron mod-board plow in Adair County, W. H. Parcels built the first plank fence in the county. He owned the first cook stove ever brought into the county, too. The first piano bought hither was the property of W. H. Parcels. The first courthouse was built by John B. Earheart, of brick. John D. Callison was the carpenter, David James furnished chairs benches and window shutters, George Horton made the furniture for the circuit and county clerks' offices, and Caleb Barrett was superintendent of the Commissioner. This building was completed, and the first county court held there in July 3, 1843. The cost was about a thousand dollars. And reveal to the God of the Tempest my woes. The hand of the white man hath swept them away." The first ordinance passed in the town of Kirksville was giving the clerk fifteen cents for every hundred words written. During that year an ordinance to passed granting license to saloons. James Barnes, R. Bell, J. Miller, and S. T. Magnos were granted licenses, the total amount of money collected for licenses being $235. In March, 1867, R. M. Powers and Henry Eckert contracted to build wooden street crossings. John H. Reed, L. Wayland, and Dilon & Burton were authorized to erect and maintain stock and hay scales on Washington Street. In April, 1867, five trustees were elected: Lewis W. Link, James Brewington, Peter J. Brown, N. M. Powers, and J. G. Jamison. Members of the Bear Creek Church had a feud and that's when they split and the Jewel Church was built.